Performs forward and reverse DNS lookup automatically. 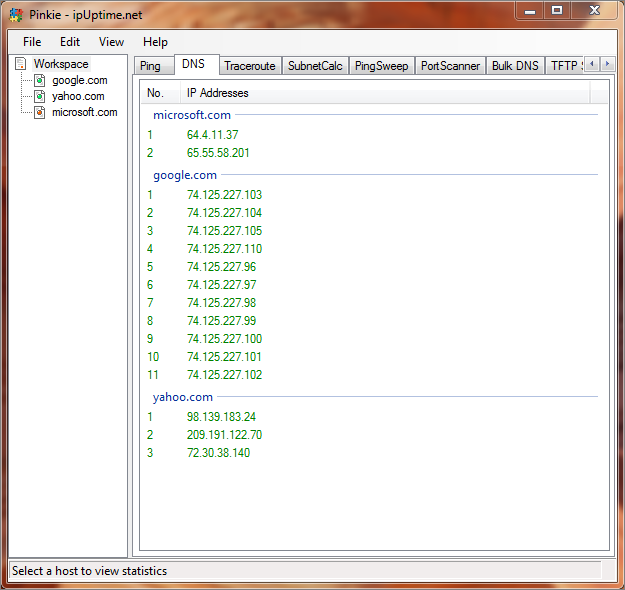 The DNS function in Pinkie works pretty much autonomously. As soon as you ping a host the DNS function immediately queries the DNS to try and resolve the host address. Pinkie is smart enough to figure out whether it is dealing with a hostname or an IP address and perform forward or reverse lookup as appropriate. The nice thing about Pinkie’s DNS function is that once a lookup is done, you can copy the IP address by clicking on it and it will be copied to the clipboard which can be paste wherever you want. The lookup result itself, can also be copied to clipboard which makes it so convenience compare to the command prompt’s Mark, highlight and then copy actions. Once you try this feature you might not want to go back to the good old Command Prompt. Don’t take my words for it. Try and see it for yourself. I feel so humbled by all the stories that are being shared. I consider myself lucky to have only experienced a dickhead cabbie tugging on my leg. And isn’t that pathetic? That I’m LUCKY I ha;v7&#821net been sexually assaulted.